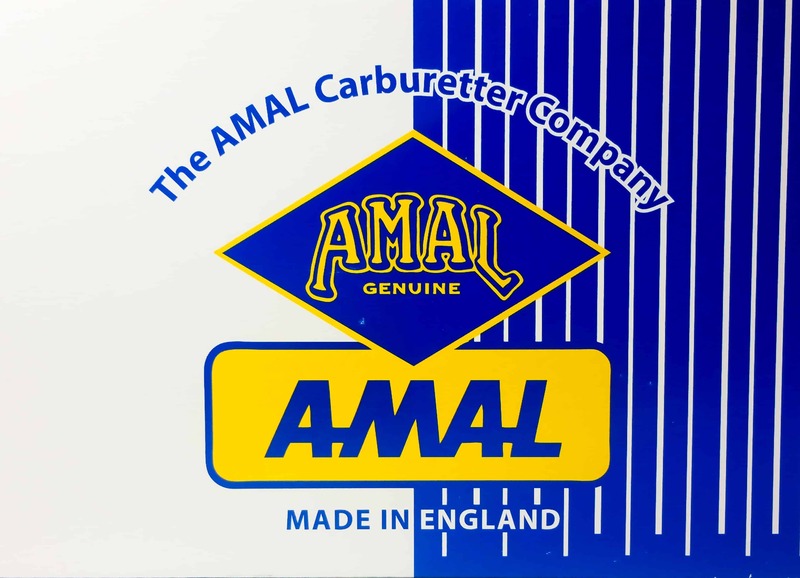 Amal Concentrics Tuning and Jetting | JRC Engineering, Inc. The carburetter proportions and atomises the right amount of petrol with the air that is drawn in by the engine because of the correct proportions of the jet sizes and the main choke bore. The float chamber maintains a constant level of fuel at the jets and cuts off the supply when the engine stops. The throttle control from the handlebar controls the volume of mixture and therefore the power, and at all positions of throttle, the mixture is automatically correct. 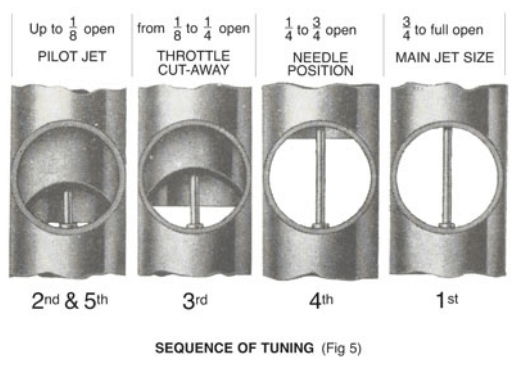 The opening of the throttle brings first into action the mixture supply from the pilot jet system of idling, then as it progressively opens via the pilot by-pass, the mixture is augmented from the main jet, the earlier stages of which action is is controlled by the needle in the needle jet. The pilot jet system is supplied by the pilot jet (30) which is detachable on removal of the float chamber. 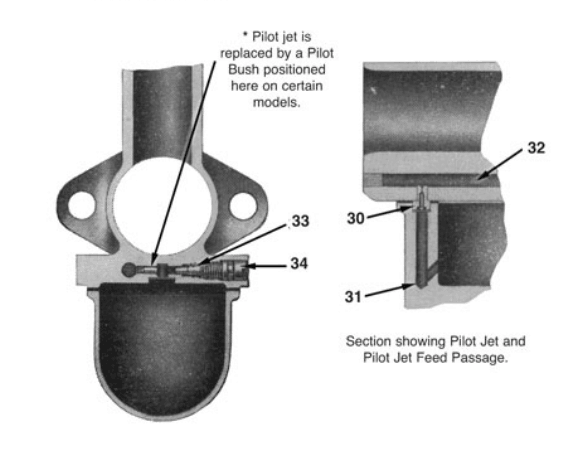 On certain other models no pilot jet is fitted but a pilot bush is inserted in the continuation of the of the pilot air adjusting screw passage. The main jet does not spray directly into the mixture chamber, but discharges through the needle jet into the primary air chamber, and goes from there as a rich petrol-air mixture through the primary air choke into the main air choke. The carburretters usually have a separately operated mixture control called an air valve, for use when starting from cold, and until the engine is warm; this control partially blocks the passage of air through the main choke. This design of carburetter offers perfectly simple and effective tuning facilities. STARTING, ENGINE HOT: Open throttle slightly and start engine. It should not normally be necessary to flood the float chamber or close air valve when starting a warm engine. STARTING, GENERAL: Experience will show when it is necessary to flood the carburetter or use the air valve, and also the best setting of the throttle valve. If the carburetter has been over-flooded or strangled, which would result in a wet engine the over-rich starting mixture – fully open the throttle valve and air valve, give the engine several turns to clear the richness, then start again with air valve fully open and the throttle valve slightly open. STARTING, SINGLE LEVER CARBURETTER. OPEN THE THROTTLE VERY SLIGHTLY FROM THE IDLING POSITION AND FLOOD THE CARBURETTER MORE OR LESS ACCORDING TO THE ENGINE BEING COLD OR HOT RESPECTIVELY. CABLE CONTROL: See that there is a minimum of backlash when the controls are set back and that any movement of the handlebars does not cause the throttle to open; this is done by the adjusters on top of the carburetter, after releasing the adjuster locknuts. See that the throttle valve shuts down freely, then reset locknuts. PETROL FEED: A filter Gauze is fitted at the inlet to the float chamber, to remove this gauze, unscrew the banjo bolt (9) the banjo and filter gauze can then be removed. Before replacement ensure that the filter gauze is both clean and undamaged and check fuel supply by momentarily turning fuel tap. Vertical loops in petro pipes must be avoided to prevent air locks. Float chamber flooding may be due to worn float needle but nearly all flooding and blockage of the filter gauze with new machines is due to impurities from the tank. Periodically clean out filter gauze and float chamber until trouble ceases or alternatively the tank may be drained and swilled out, etc. FIXING THE CARBURETTER AND AIR LEAKS: Erratic slow running is often caused by air leaks, so verify there are none at the point of attachment to the cylinder or inlet pipe. A sealing ring is fitted into the attachment flange of the carburetter. Also in old machines look out for air leaks caused by warn throttle or worn inlet guide. BANGING IN EXHAUST May be caused by too weak of a pilot mixture when the throttle is closed or nearly closed – also it may be caused by too rich a mixture and air leaks in the exhaust system. The reason either case is that the mixture has not fired in the cylinder and has fired in the hot silencer. If the banging happens when the throttle is fairly wide open the trouble will be ignition ignitions – not carburetion. BAD PETROL CONSUMPTION Of a new machine, may be due to flooding caused by impurities from the petrol tank lodging on the float needle seat, and so prevents its valve from closing. Flooding may be caused by a worn float needle valve. Also bad petrol consumption will be apparent if the needle jet (24) has worn; it may be remedied or improved by lowering the needle in the throttle, but if it cannot be – then the only remedy is to get a new needle jet. AIR FILTERS: These may affect the jet setting, so if one is fitted afterwards to the carburetter the main jet may have to be smaller. If the carburetter is set with an air filter and the engine is run without it, take care to not overheat the engine due to weak a mixture; testing with the air valve (Page 5), will indicate a larger main jet and higher needle position are required. EFFECTS OF ALTITUDE ON CARBURETTER: Increased altitude tends to produce a rich mixture. The greater the altitude, the smaller main jet required. Carburetters ex-works are set suitable for altitudes 3,000 feet approximately. Carburetter used constantly at altitudes 3,000 to 6,000 feet should have a reduction in main jet size of 5%. and thereafter for every 3,000 feet in excess of 6,000 feet altitude further reductions of 4%, should be made. 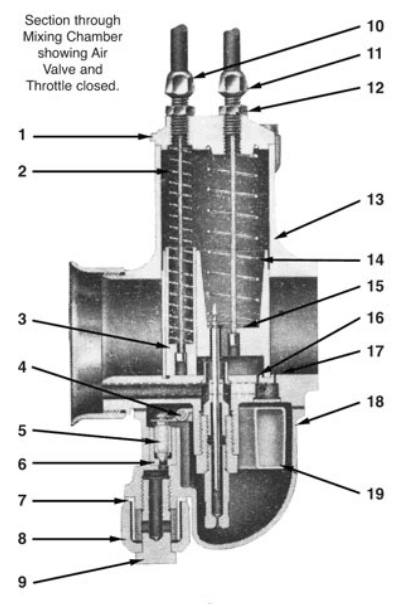 When replacing the valve assembly, see that the jet needle goes into the holes in the choke tube, needle jet and main jet and that both the throttle and air valve spring locate correctly in the mixing chamber top. When refitting the float, engage the float needle recess in the horseshoe section of the float and fit in the float chamber. Check that the needle jet (24) jet holder (28) and and the main jet (29) and fully tightened together before screwing assembly into the body. There are only two possible faults in carburation, either richness or weakness of mixture. Black smoke in exhaust. Spitting back in carburetter. Petrol spraying out of carburetter. Overheating. Four stroke, eight-stroking. Acceleration poor. Petrol feed – Check that jets and passages are clear, that filter gauze in float chamber banjo connection is not choked with foreign matter, and that there is ample flow of fuel. Check there is no flooding. Air leaks – At the connection to the engine or due to leaky inlet valve stems. Defective or worn parts – As a loose fitting throttle valve, worn needle jets loose jets. Air cleaner being choked up. Removing the silencer or running with a straight through pipe required a richer setting. Having verified the correctness of fuel feed and that there is no air leaks, check over ignition, valve operation and timing. Now at throttle position shown on page 7, Fig.5, test to see if mixture are rich or weak. This is done by partially closing the air valve, and if engine runs better weakness is indicated, but if engine runs worse richness is indicated. NOTE: It is not to cure a rich mixture at half throttle by fitting a smaller main jet because the main jet may be correct for full power at full throttle: the proper thing to go is to lower the needle. THROTTLE ADJUSTING SCREW (26). Set this screw to hold the throttle open sufficiently to keep the engine running when twist grip is off. As “O” ring is fitted to the screw to hold this adjustment by friction. MAIN JET (29). The main jet controls the petrol supply when the throttle is more than three-quarters open, but at smaller throttle openings, although the supply of fuel goes through the main jet, the amount is diminished by the metering effect of the needle in the needle jet. Each jet is calibrated and numbered so that its exact discharge is know and two jets of the same number are alike. NEVER REAM A JET OUT, GET ANOTHER OF THE RIGHT SIZE! The bigger the number ther bigger the jet. NEEDLE AND NEEDLE JET (22 and 24). The needle being taper either allows more or less petrol to pass through the needle jet as the throttle is opened or closed throughout the range, except when idling or nearly full throttle. The taper needle position in relation to the throttle valve can be set according to the mixture required by repositioning the jet needle clip in any of three positions thus raising or lowering it. Raising the needle richens the mixture and lowering it weakens the mixture at throttle openings from quarter to three quarters open ( see Fig 5. pag 7). The throttle needles are marked with a single groove around the top diameter for use on the 600 series carburetter, the 900 series carburetter needles are identified by three grooves around the top needle, throttle needles identified by two grooves are used on certain models for both series 600 and 900 carburetters. 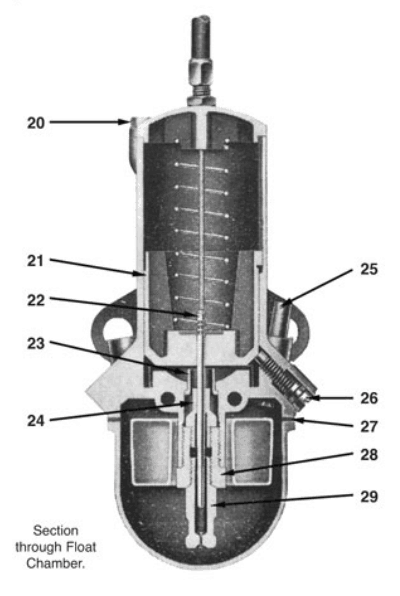 THROTTLE VALVE CUT-AWAY. The atmospheric side of the throttle is cut away to influence the depression on the main fuel supply and thus gives a meaning of tuning between the pilot and needle jet range of throttle opening. The amount of cut-away is recorded by a number marked on the throttle valve, viz., 622/3 means throttle valve type 622 with a No.3 cut-away; larger cut-aways, say 4 and 5, wive weaker mixtures and 2 a richer mixture. AIR VALVE (3) Is used only for starting and running when cold, and experimenting with, otherwise run it wide open. TICKLER (25) A small plunger, spring loaded, fixed in the carburetter body. When pressed down on the float the needle valve is allowed to open and so “flooding” is achieved. Flooding temporarily enriches the mixture until the level of the petrol subsides to normal. ALCOHOL FUELS. When using alcohol fuels, the following new components are necessary. A metallic banjo, preferably double feed if not already fitted, float chamber 622/051, banjo bolt washer 13/163, needle jet 622/100, jet needle 622/099 or 928/099 according to type of carburetter, filter gauze 376/093B and banjo washer 14/175. The main jet must be increased for straight alcohol by approximately 150%. The final setting must be a question of trial and error according to the nature of the fuel being used. When using alcohol fuels it is advisable to error on the rich side to avoid engine overheating. NOTE. The carburetter is automatic throughout the throttle range – the air valve should always be wide open except when used for starting or until the engine has warmed up. We assume normal petrols are used. READ REMARKS ON SECTION 3 and 4 For each tuning device, and get the motor going perfectly on a quiet road with a slight up gradient so that on test the engine is pulling. 1st MAIN JET With throttle position 1 (fig 5). If at full throttle the engine runs “heavily” the main jet is too large. If at full throttle by slightly closing the throttle or air valve the engine seems to have better power, the main jet is too small. With a correct sized main jet the engine at full throttle should run evenly and regularly with maximum power. If testing for speed work, ensure the main jet size is sufficient for the mixture to be rich enough to keep the engine cool, and to verify this, examine the spark plug after taking the first run, declutching and stopping the engine quickly. If the plug body at its end has a cool appearance the mixture is correct: if sooty, the mixture is rich : if however there are signs of intense heat, the mixture is too weak and a larger main jet is necessary. 2nd PILOT JET (fig 5) with throttle in position 2 and 5. With engine idling too fast, with the twist grip shut off and the throttle shut down on to the throttle adjusting screw, and ignition set for best slow running: (1) Screw out throttle adjusting screw runs slower and begins to falter, then screw pilot air adjusting screw in or out to make the engine run regularly and faster. (2) Now gently lower the throttle adjusting screw until the engine runs slower and just begins to falter, adjust the pilot air adjusting screw to get best slow running: if this 2nd adjustment makes the engine run too fast, go over the job again a third time. Both the throttle adjusting screw and pilot air screw have an “o” ring fitted to hold adjustment by friction. 3rd THROTTLE CUT-AWAY With throttle in position 4 (fig 5). ifm as you take off from idling position, there is objectionable spitting from the carburetter, slightly richen the pilot mixture by screwing in the air screw sufficiently, but if this is not effective, screw it back again, and fit a throttle with a smaller cut-away. If the engine jerks under load at this position and there is no spitting, either the jet needle is much too high, or a larger throttle cut-away is required to care richness. 4th NEEDLE With throttle in position 4 (fig 5). The needle controls a wide range of throttle opening and also the acceleration. Try the needle in the lower position, with the clip in the groove at the top; if acceleration is poor and with air valve partially closed the results are better, raise the needle by two grooves; if very much better try lowering the needle by one groove and leave it where it is best. If mixture is still too rich with clip in groove No 1. nearest the top, the needle jet might need replacement due to wear. If the needle itself has had several years of use replace its also. 5th FINALLY Go over the idling again for final touches. First of all , slacken the throttle stop screws and put the twist grip into the shut off position to allow the throttles to shut off; there should be a slight backlash in the cables which backlash can be obtained , if necessary, by screwing in the cables adjusting screws on top of the carburetter after releasing lock nuts. Then, with the handlebar in the normal position , and with the throttles closed, adjust the cable adjusting screws so that on the slightest opening twist of the grip, both throttles open simultaneously, then reset the lock nuts. To set the carburetters, follow the procedure as given in section 5, and bear in mind these “Hints”, which may be useful: main jet sizes are of course selected by checking the effect of the mixture on the spark plugs after taking a run at full throttle over a straight piece of roads; the smallest pair of jets that give the best maximum speed are usually correct provided that the plugs do not show any signs of excessive heat. It might be that for really critical tuning, one carburetter might require a different jet size from the other. For slow running, set the twist grip to make the engine run slowly but just faster than a “tick-over”: then gently screw in in the throttle stops to just hold the throttles in that position and return the twist grip into the shut position, leaving the engine running on the throttle stops. The next thing to do is set each carburetter according to paragraph 2, on section 5, to obtain the idling by screwing down the throttle stop screws and adjusting the pilot air screws accordingly. Regarding the setting of the pilot, a fairly satisfactory method is to detach on spark plug lead, and set the pilot air adjusting screw on the other cylinder as a single unit, and then reversing the process to the other cylinder. It may be found that when both leads are connected to the spark plugs, the engine runs slightly quicker than desirable, in which case, a slight readjustment of the throttle stop screws will put this right. It is essential that the speed of idling on both cylinder is approximately the same, as either make or mar the smoothness of the get-away on the initial opening of the throttle. It is essential with twin carburetters that the throttle slides are a good fit in the bodies, and also that there is no suspicion of air leaks at either of the flange attachments to the cylinder. Regarding lower end throttle range, which is always the more difficult to set, one can only take excessive pains to make a quite sure that the control cables are perfectly adjusted, without any excessive back lash or difference in the amount of back lash between one carburetter and another; otherwise one throttle will be out of phase with the other, and so resulting in lumpy running. Tiger 110, TR6A, B, C.